My first hobby was Photography, then Scrapbooking, then Scrapbook Supply Storage - full time. That’s when I knew I had too much and I stopped enjoying my hobby because I couldn’t find what I knew I had. And in a number of cases, I couldn't remember that I had already purchased some things. Once I ended up with 5 sets of the same unmounted rubber stamps! I guess when I like something - I really like it! Some of the suggestions I will use here will be for using recycled items, these suggestions will appear in green. When I first started Scrapbooking, I didn’t have many supplies. I bought one of the big Crop In Style XXL wheeled storage totes and thought I would never fill it up. Now I have a hard time keeping it all in one room. But, the key is organization. By being organized, I can find what I want, speed up my scrapbooking and card making and I don’t waste money on duplicates. I try really hard to clean up after a project, put unused items away where they belong and to stay organized. I stopped purchasing for a while and looked at how I liked to scrap - then decided the best way for me get organized and stay organized. 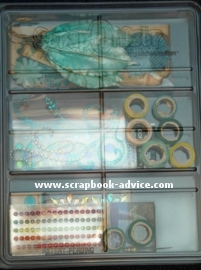 These are just suggestions that I have picked up from other scrappers but certainly not the only ways to get organized. Scrapbook Supply Storage - It’s a trial and error process and can change, of course, as there are always new products to come along. 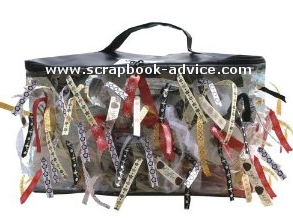 Ask others, check out your local scrapbook store for suggestions on scrapbook supply storage, read scrapbooking blogs, ask questions in chat groups, check magazines or ask others to post photos of their scrap area. I remember one group I was in put out a call for photos of scrap rooms and didn’t get any. We later discovered that they were so messy, no one wanted to post photos. My first step towards Scrapbook Supply Storage was a quick Inventory (hand written is OK) can keep from purchasing duplicates. I keep an inventory of my ink pads, punches (punch one out & glue to the page), decorative edge scissors (cut a strip to glue inside the book) embossing powder colors, glimmer mist colors, alcohol ink colors, Spellbinders shapes, in a little school binder (or spiral notebook) and keep my little booklet handy when I am out shopping or cruising the internet for products or just to help me remember what I have while I am scrapping and where that item should be located. Wish List - To help you get the best price. I also keep in my Inventory Book my Wish List. Then when I purchase it, I note the purchase date and price. Now that I scrapbook for others, I need the price information. You may wish to keep that to find the best prices. For Scrapbook Supply Storage of Printed Papers and most of my Embellishments, I store by theme. Say I have a cooking theme, if I have any printed papers and embellishments related to cooking, I store in flat drawers by theme. The theme names are on the outside of the Drawers. Wedding, Baby Boy, Baby Girl, Disney, Halloween, Fall, Easter, Christmas, Valentines, Recipe, Gardening, Beach, Military, Patriotic, Travel (Italy, Alaska, England, Germany, Egypt), Birthdays, Time and Moving are some of my Themes. Each theme does not necessarily have a drawer all to itself - some may have mixed themes, each one in a large plastic zip-lock bag. If I have any Solid Papers that are a color that would go particularly well with the printed papers, specially if I purchased them together, I keep them with the themed prints. 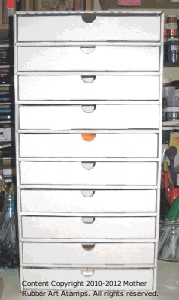 For the majority of my Scrapbook Supply Storage, I use the 12 x 12 Sterlite 3-Drawer Units and stack them. I get mine at WalMart for anywhere from $9.00 to $12.00. I prefer the drawers as that keeps the dust out. I put the papers flat on the bottom and the embellishments, rubber stamps and “lumpy stuff” on top. When I am ready to re-organize, I pull out the drawer and switch it with another - or if I don't have enough to fill the drawer, bag the contents and merge the contents with another drawer and move the label as well. When I am ready to crop a certain theme, I pull out the drawer (or the bag) and everything is there for that theme. Great to take to my scrapping desk, across town for a Crop, or to a Retreat or Vacation along with my basic tools. 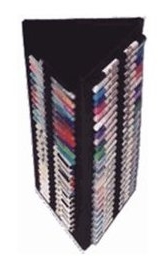 These stack very nicely and come in sizes to fit 12 x 12 paper, 8 1/2 x 11 paper and the mini stacks hold things like pens, ribbons, office supplies, etc. Scrapbook Supply Storage for the Paper Packs, and Stacks - I have 12 x 12 plastic trays by Display Dynamics - each labeled on the side so they are easy to find. I have trays for Blacks, Whites, Metallics, etc. When I purchase purchase matching Stacks of 12 x 12, 8 x 8 and 4 x 6 photo mattes, they are kept on the trays together. 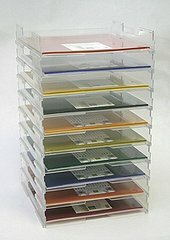 Here's a link to see the options available and to purchase these Trays and Bases by Display Dynamics. For additional Scrapbook Supply Storage within the trays, I also have the plastic dividers that can divide the tray into sections 2" x 2" or 2" x 4" or 2" x 6". Things like buttons, clock faces, decorative paper clips, tiny clothes pins, slide mounts, flowers, buttons, and keys go nicely in those drawers. 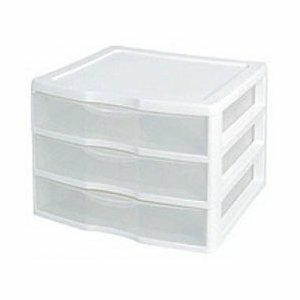 Desk organizer inserts would be great for this as well or even recycled ice cube trays. I keep most of my Solid Papers and Non-themed Embellishments - usually in color groups - Black & Whites, Browns, Beiges & Earthtones, Blues, Purples, Greens, Reds, Oranges, Yellows and Metallics. I keep a separate Scrapbook Supply Storage of Specialty Papers - faux fur, leathers, burlap, page size mesh and fabric in a hanging file storage for 12 x 12 papers. If I have Die Cuts I like to keep them in the drawers with the themes. I keep my generic Brads, Eyelets, Charms, Beads, Stickers, Mirrors & Fibers by color unless they are theme specific. 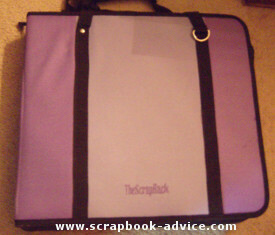 I have recently discovered The ScrapOnizer Scrapbook Supply Storage and find they work great for all sorts of storage. I like the 12 x 12 Sizes to hold papers, particularly if I go to a Scrapbook Store or an event like Expo or CHA. The Scraponizer keeps the papers from getting wrinkled or bent and and it's also great to take to a crop. They are remarkably sturdy. Here below, I am using the 8 1/2 x 11 size to hold my teal embellishments & ribbons and sticky bling items that will remain on cards until I have used them. For Scrapbook Supply Storage of all the smaller items that I have a lot of usually get one of two storage options depending on how much space they need. ***I have recycled canning jars with new lids and bands or white plastic jar lids. 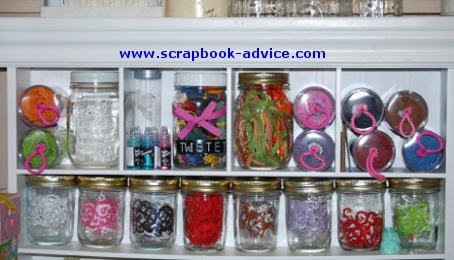 The pint jars and half-pint jars fit perfectly onto the shelves of the Making Memories Embellishment Center. I use these for buttons, Twistel, raffia and die cut felted ribbon so I can see the available colors. The jars also keep the felted ribbons from getting folded or crushed. ***When I have a lot of items like brads, eyelets, and mirrors these usually get their own labeled boxes that stack neatly on top of one another. I have covered some left over boxes with a nice contact paper (also left over) that goes with my scrapping room and added labels. You can also cover them with Scrapbook paper and Embellishments, paint to match your room, or even fabric. If I get too much for one of the boxes I can cover another box, or move the contents and the label to a larger box. These could be painted, stamped, embellished or covered with fabric or scrapbook paper to suit you, but either way it's an inexpensive and changeable option to your Scrapbook Supply Storage needs. 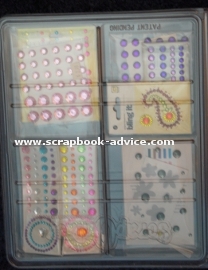 ***I have several friends who use a big expandable Desk Top Binder called ScrapRack and use it store their paper, cardstock, embellishments - well everything - by color or theme. I have finally been persuaded to get my own and it has become my new favorite Scrapbook Supply Storage. It's on a small table with wheels and is expandable - I like to put my printed papers and matching solid papers, embellishments, photos and all sorts of other scrapbooking related items. With the papers in the plastic sheet protectors, it is so easy to flip through them and find what I want very quickly. I first bought their Travel Pack in a beautiful Lavender & Purple and I absolutely love it. It was no useful, I finally took the big step and bought the ScrapRack with the 7 spinders. The Spinders can come out of each and be switched around from the Desk Top Scrap Rack to the Travel Pack. Click on the picture below for a link to their website. The also tell you how to get organized using the ScrapRack. I recently went on a 6-week tour of the country and filled up my Travel Pack with everything I thought I would need to do my scrapbooking. I was amazed at how much it held, how easy the zippers worked, and how sturdy the piece was. I stuffed mine when I left and as I collected scrapbooking supplies at every local scrapbook store I could find, it kept adding to it and it just seemed to get bigger and bigger. Mine only had 1 spine in it, but it will hold as many as three. It also comes in solid Black and Light with Dark Pink. 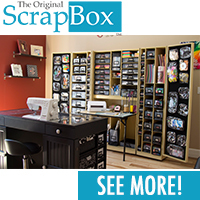 A great option for Scrapbook Supply Storage. 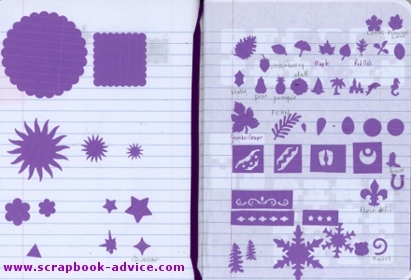 For Scrapbook Supply Storage of Flat Embellishments, Stickers and Die Cuts - I keep these in a Crop in Style, PSB (Paper Sticker Binders). These binders have 12 x 12 plastic pages that fit papers and stickers from 12" x 12" down to 2" x 2" or 2" x 12". These are really nice for printed papers as well as specialty paper as the plastic pages make it easy to quickly flip through the binder quickly for what you want without having to separate patterns or touch the actual papers. Again I have themed sections as well as a separate section for letter stickers and fonts. 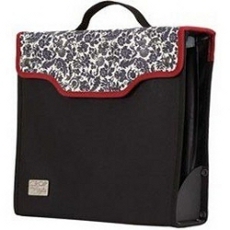 They are 3-ring binders, with several side pockets, and zip shut - great for taking to a crop. Tools: For Scrapbook Supply Storage of Punches, Ink Pads, Re-inkers, Pens & Markers, Embossing Powders, Glimmer Mist, Alcohol Ink, Paint Daubers, Decorative Edge Scissors, I usually keep each of these types of tools in separate containers with labels on the outside. Punches are kept in flat 1 inch drawers where I can pull the drawer open to see the image on top. I can also go to my inventory page to see what I have and locate where it is stored. Here is a page from my Inventory book. Ink Pads are kept in little shelf units where they can lie flat - either right side up or upside down - depending on if they are dye based or pigment based. An old storage unit for Cassette Tapes works great standing on it’s side. I usually write the name of the color with a sharpie or small tape label maker. Usually they are lined up by color grouping - Blacks, Browns, Blues, Greens, etc. Not all Scrapbook Supply Storage items need to be purchased. I did however purchase three of the Ink Pad Palaces from MotherRubber.com. They are really nice, light weight but very sturdy cardboard, and inexpensive. These can be decorated to match your Scraproom or where ever you keep your supplies with stamps, paper, fabric or embellishments. Re-inkers are stored on the same shelf as the ink pads and I make a note on the ink pad if I have a re-inker. Pens, Markers, Copics are stored flat - best for those markers that have dual points, then the ink does not settle in one end or another. These can be kept by color family, metallics, etc. Again, I have 2 Scrapbook Supply Storage areas. I keep most of them in my mini-sterlite drawers like above and for crops I use the Crop-In-Style Pen Caddy that tucks neatly inside the top of the XXL for traveling. Other items I keep in my pen caddy are my craft knives. embossing stylus, and water pens. Here the pen caddy is shown opened up, but it stores or travels pretty flat when the three sides are folded together. Embossing Powders are kept in 1 inch drawers and if the color is not printed on the top, I write it with a Sharpie or small tape label maker. 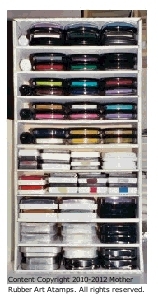 Glimmer Mist, Alcohol Inks, Paints & Paint Daubers are all kept in separate plastic storage boxes. The boxes are labeled on the outside so I can grab whatever I need - the lids keep the dust out. 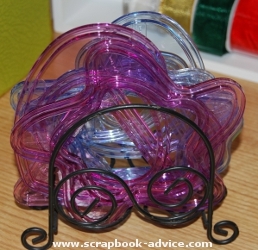 Decorative Edge Scissors can be another challenge for Scrapbook Supply Storage. Mine are kept in a small clear bucket and I use my inventory booklet to see which ones I have. Some of my friends keep their scissors hanging up on peg board hooks, which makes it really easy to see what you have. Each pair of scissors has the shape that is cut printed on the outside of the blade. Maybe if I hung mine up like this I would use them more. Here is the page from my own Inventory Book where I have saved the cutting diagrams from the packaging of the scissors or actually cut a strip of black paper showing the design of the cuts. Rulers, French Curves, & Circle & Shape Cutters can be kept either hanging up on peg board hooks or stored flat on a shelf or standing up in a small box or bucket or in my case an old recycled napkin holder. A perfect example that you don't have to spend money to get great Scrapbook Supply Storage ideas. Rubber Stamps (Wood Mounted) - Like my Printed Paper, I store most of my Wood Mounted Stamps in the Themed Drawers. For stamps that don’t relate to a specific theme, or that can be used for Holidays, I keep them in flat 1 inch drawers, usually with a name on the outside of the drawer or an image of the stamp. I also have a book with copies of my images and a note about where it is stored. 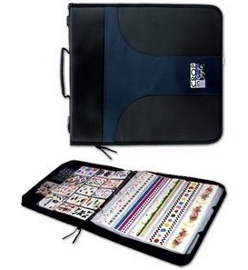 Stamps (Unmouted) - I like to keep my ½ sheet stamps, on sheet protectors in a 3-ring binder - usually by theme. I keep an inventory list of general stamp topics or specific stamps in my inventory notebook so I don’t purchase duplicates. I have right now several duplicate purchases that I made before my inventory that I am ready to give away. These purchases are what started the Inventory Book in the first place to maintain my Scrapbook Supply Storage. All of my notebooks and page protectors are recycled from old school projects. A Zippered 3-ring binder is also an option especially for taking to crops because if the stamps come lose, they will not get lost. 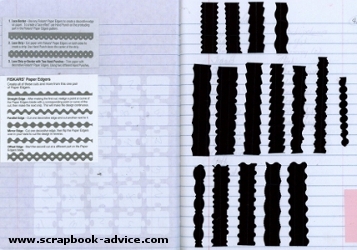 Or, just pull out the page with the stamps and the printed detail version to take with you. 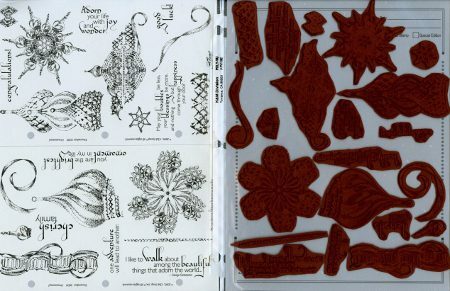 Below are photos of my unmounted stamps from ClubScrap.com of the Ornamental Kit from December 2009. 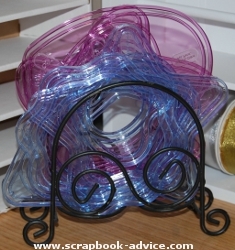 Ribbons & Fibers - For Ribbons & Fibers, I keep them 3 ways. A. For the ones that are long enough to be on rolls, I have the Memory Makers Embellishment Storage Units with part of my Ribbon assortment on the spools. B. For the short pieces of ribbon that I purchase separately, I keep them in a Ribbon Purse, arranged by color. This is really handy to take on Crops as it holds over 200 different ribbons selections. There is also one that holds twice that. C.	For themed, Christmas, Halloween, Fall - I keep those in my Themed Drawers. Adhesives - For the Scrapbook Supply Storage of my Adhesives, I keep all different kinds in a large plastic box with a lid. Yes, all kinds in one box - ATG tape, tape runners, re-positionable, pop dots, glue lines, photo splits, vellum adhesive, etc. 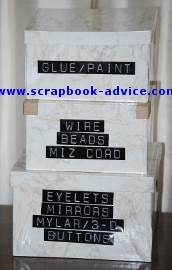 This box is always handy close to my scrappin’ area as I use many different adhesives when completing a project, depending on what kind of paper or embellishment I want to use. Photos - This is a tough one because we have so many. Back when I had to print all my photos from a roll of film, I had to store my photos and negatives. For both of these I would suggest a photo safe storage. Next to paper, photos are probably the most difficult Scrapbook Supply Storage. For my Negatives, I currently use an 8½ x 11 3-ring photo safe notebook with photo safe sleeves that I purchased from a photo shop. For my Digital Images, I have them on my computer, with a copy burned to a CD. I also upload them all to the Kodak Gallery which makes it easy to order prints which can be mailed to me or developed locally for pick up. I would suggest keeping copies somewhere so you can access them if you lose one method of storage to a computer crash, camera or disk loss, or natural disaster. There are many types of companies for storage and printing - ask others what they use and experiment to see which company suits you the most or is the easiest for you to use. I print most of my photos and keep them in photo safe storage boxes that I purchased from Creative Memories until I am ready to scrap. These nice black boxes come in 2 sizes and have separate boxes inside with labels to record the type of photos. I like that I can just reach in and grab a group of photos, grab my themed drawer and I am out the door for a crop. As with developers and storage companies for your digital images, there are many other companies and types and sizes of boxes that you can use. Be smart, however, with your Scrapbook Supply Storage of those precious photos and use photo safe storage of some sort so you don’t end up with faded, creased, or torn photos. I hope this page has helped give you some ideas about how to get started with Scrapbook Supply Storage, including a few using Recycled Items. Remember, it's a process and get ideas from others as well. 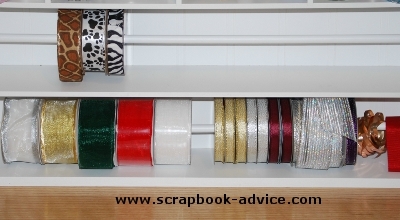 Here are some ideas to help you Design Your Scrapbook Room or Corner or Closet.